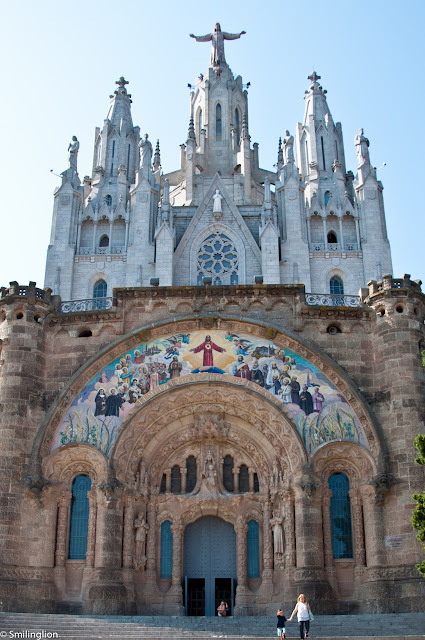 Overlooking the city of Barcelona, and perched on Mt Tibidabo, the highest point of the city, is the iconic Temple Expiatori del Sagrat Cor. Though relatively new, what it lacks in history (it is less than a hundred years old) it makes up with presence. From almost any point in Barcelona, the church can be seen in the distance on the mountain, as if it is watching over Spain's second largest city. Accessible by road, it is nonetheless advisable to experience the journey up by way of a century-old tram line and then an equally old funicular (cable car) up the very sleep slopes. 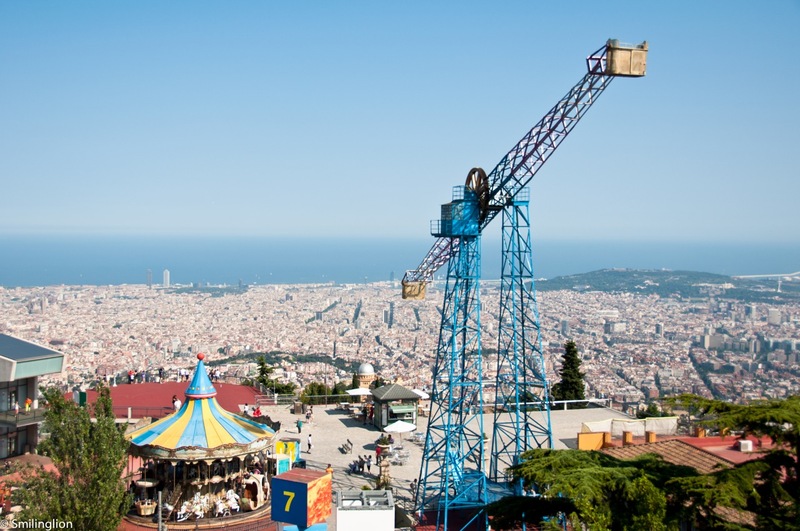 Interestingly, Tibidabo is also famous for it's amusement park, which also has a century-old history. The rides afford magnificent views of the city and the sea, and is very popular with children during the summer months. But to us, the true attraction of Tibidabo is neither the church, the amusement park nor the views from the top of the hill, but what sits literally at the bottom of it at Number One Avinguda del Tibidabo. 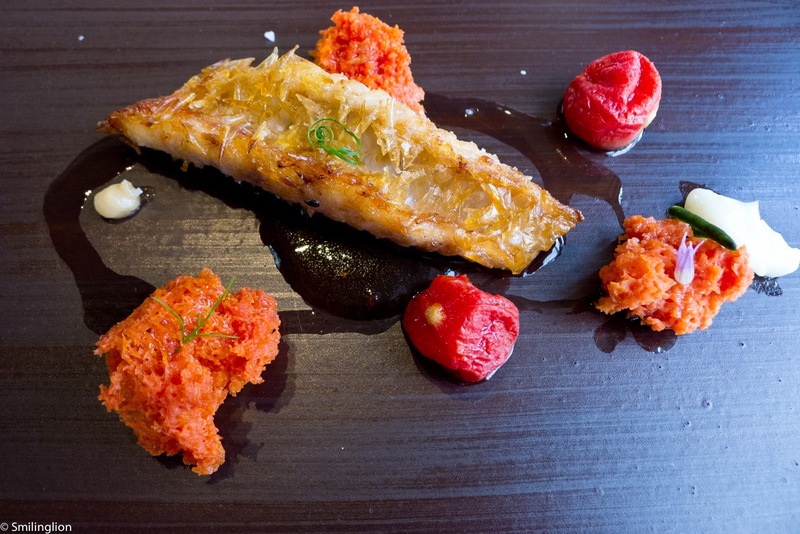 For there we had one of our best meals in Spain and certainly the best in the city last year (see earlier review). 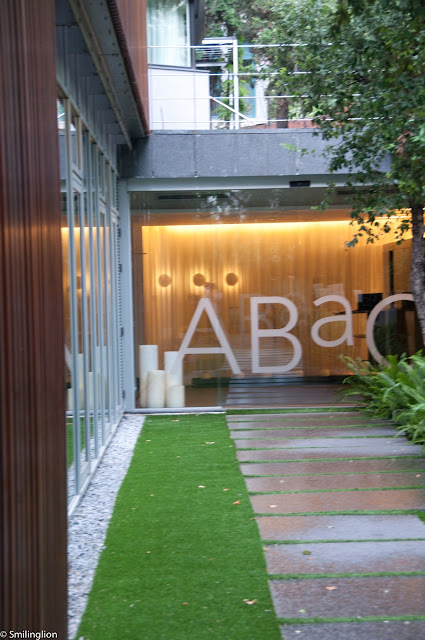 For all the fine dining restaurants we were going to visit in Spain on this trip, the 2 Michelin starred ABAC was the only one we were going to repeat. The last time we had the smaller menu, but this time we came for lunch prepared having had no breakfast and having no plans for dinner. 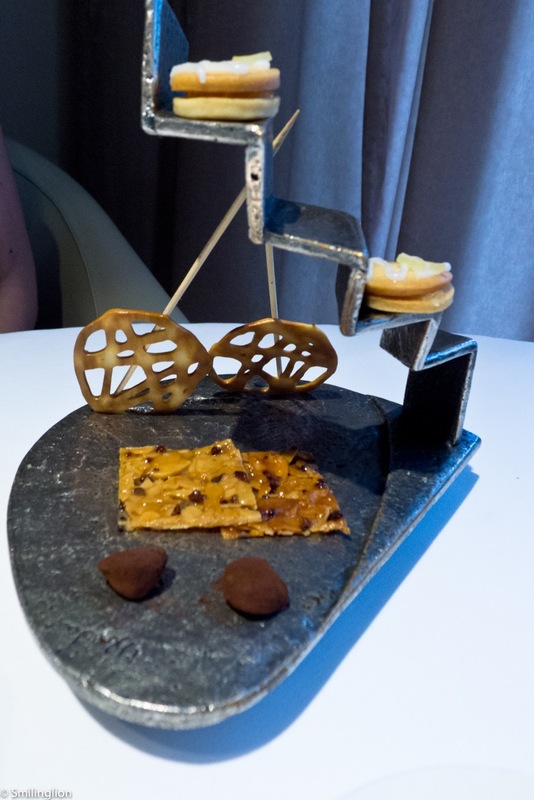 So we ordered the Grand Tasting Menu. Nitro cocktail: The amuse bouche was made at our table. 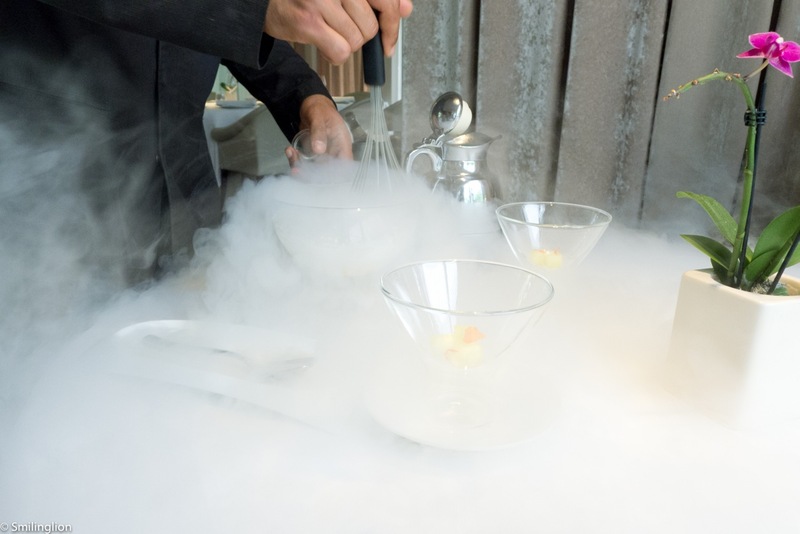 Our server poured some lime juice into a glass bowl and then sprayed liquid nitrogen into it. 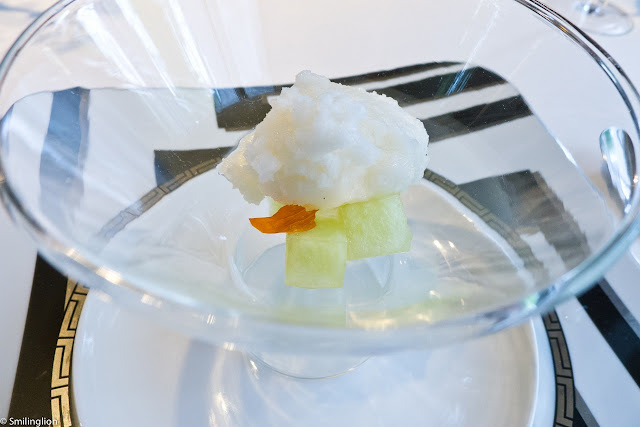 After whisking it for a while, perfectly formed lime sorbet was made, which was then scooped into a cocktail glass contained melon cubes. This was very refreshing and exquisitely done. Carril clam and kaffir lime curry: This was so delicious. 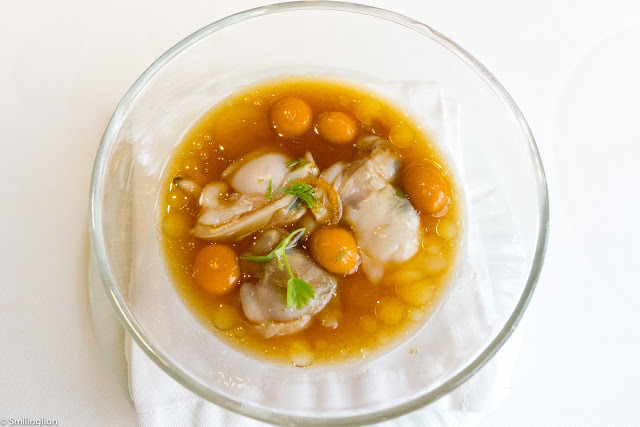 The consommé of clam jus had a very strong Thai influence due to the use of kaffir and curry, and the globules floating in the glass would burst in the mouth releasing even more flavour. Barbecued sardines-style cured king mackerel and bread with tomato: This was a daring dish but as it turned out, the ingredients were perfectly complementary. 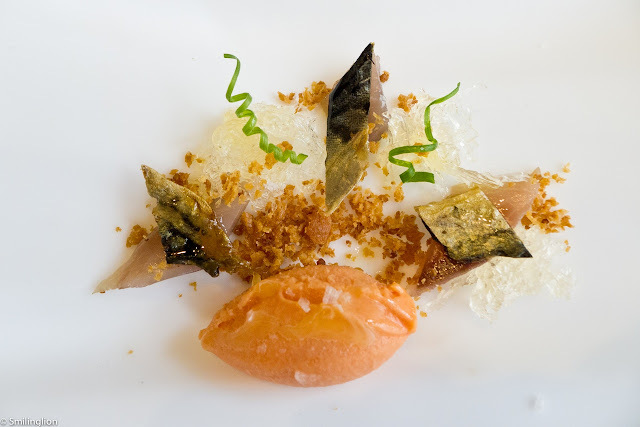 We found the presence of a tomato sorbet quite disconcerting but it served to take some of the tartness from the cured mackerel. 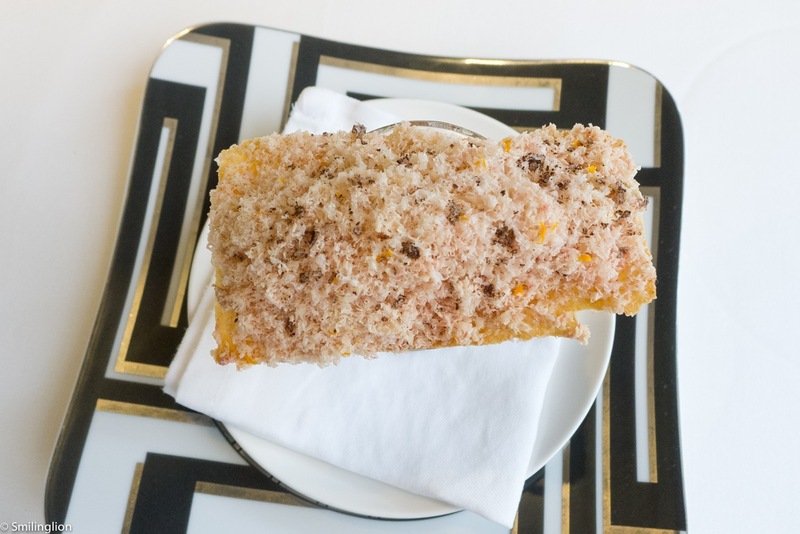 The bread was in the form of toasted breadcrumbs which was quite brilliant as it gave the dish some crunch. Thin foie gras focaccia with toasted pine nuts onion consommé and orange zest: A crowd favourite, we gather, since we had this previously as well. 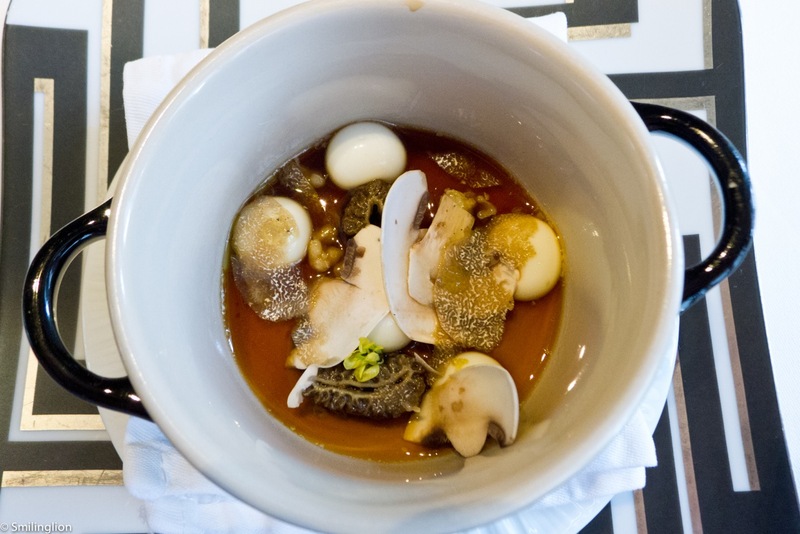 But where the onion consommé was insipid and slightly too acidic the last time, this one was excellent. Parmesan gnocchi with raw mushrooms, nuts, truffle oil and a mushroom infusion with lemongrass: An earthy dish full of umami flavours, this was quite spectacular. 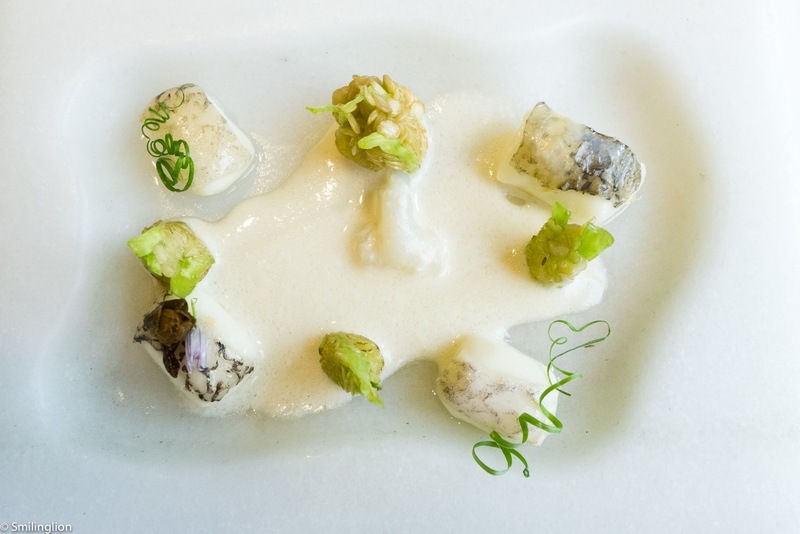 The globules were of liquid parmesan and they went well with the truffles and the mushrooms. Small salt-cod fillets, pickled padron pepper seeds with capers, salt-cod gravy with cardamom and alliaceas: It was an interesting version of cod which taste was new to us. The cod was flavoured with some acidity and a creamy yet rather salty sauce which was unusual but nonetheless very good. 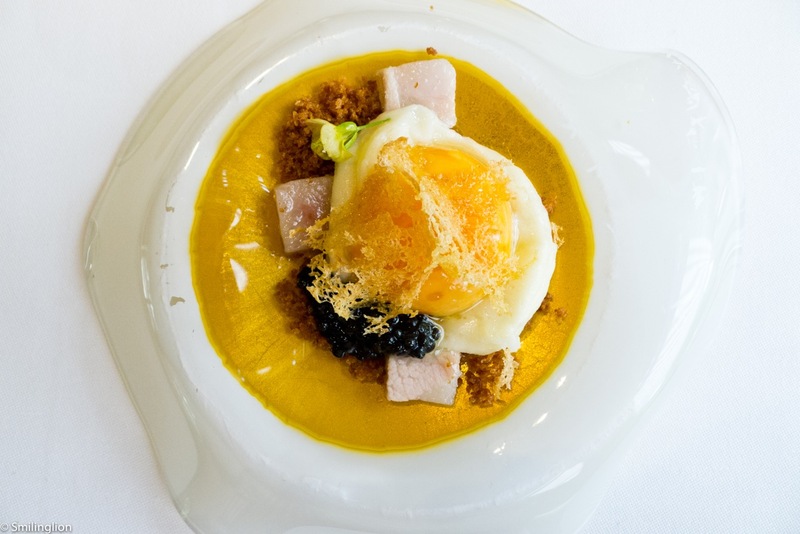 Egg yolk cooked in seawater with caviar and lemon parmentier: Another brilliant dish. In addition to the runny egg yolk and the lardons, what made it special was the presence of the toasted bread crumbs which gave the taste of the dish a different dimension. 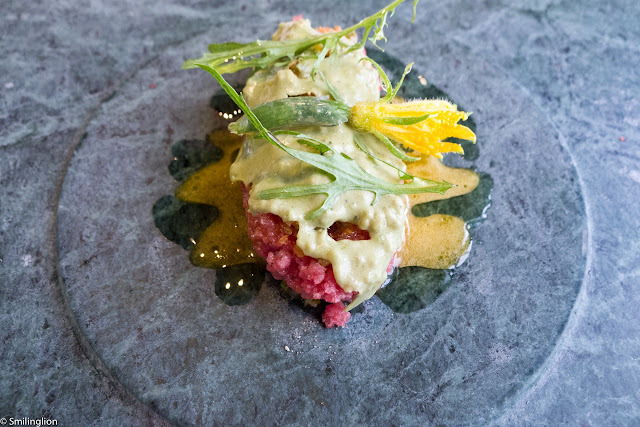 Smoked steak tartare, beef with dressing, cooked egg yolk, veil of mustard and pepper bread brittle: Another repeated dish from the last meal, this was as good as we remembered it. Roasted scallop, lime meuniere and lemon parmentier, baby carrots stir-fried in butter: The scallop was perfectly lightly roasted and accompanied by the luxuriant buttery accompaniment with the carrots adding some sweetness to the dish. 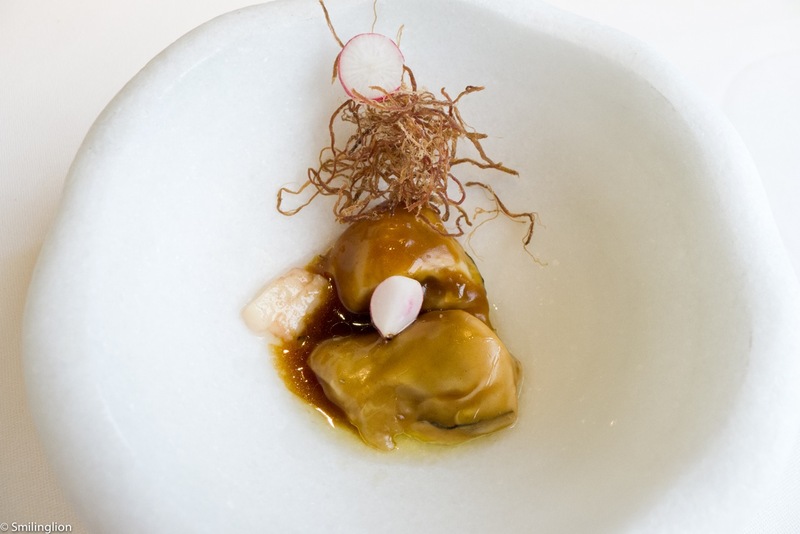 Beef with oysters and baby radishes: In this case, it was oysters with a splash of beef stock consommé and dried stringy beef floss. It was very good. 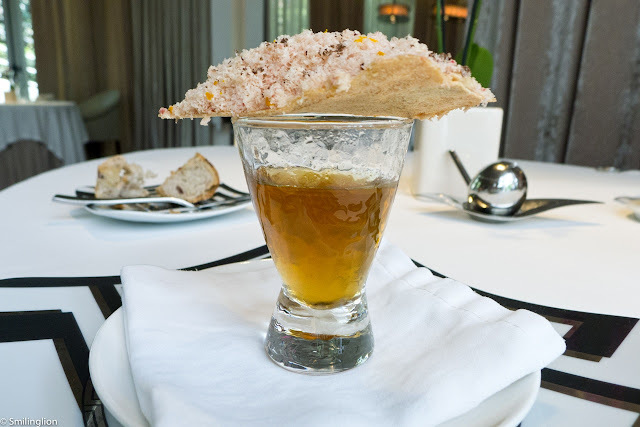 Pearly razor fish with tomato bread and baked garlic soup: The fish was excellent, especially with the strong garlic and tomato accents complementing its flavour. 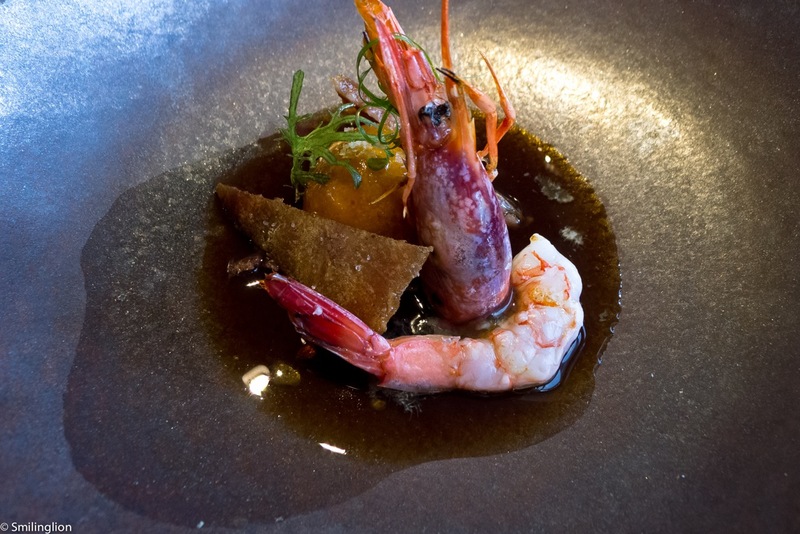 Iberian pork tail and sparerib meat, Palamos prawn, coral consommé and curry bun bread: An interesting and delicious combination of prawn with a dark pork stock. The pork tail was a bit hard and chewy but the rest of the dish was very good. 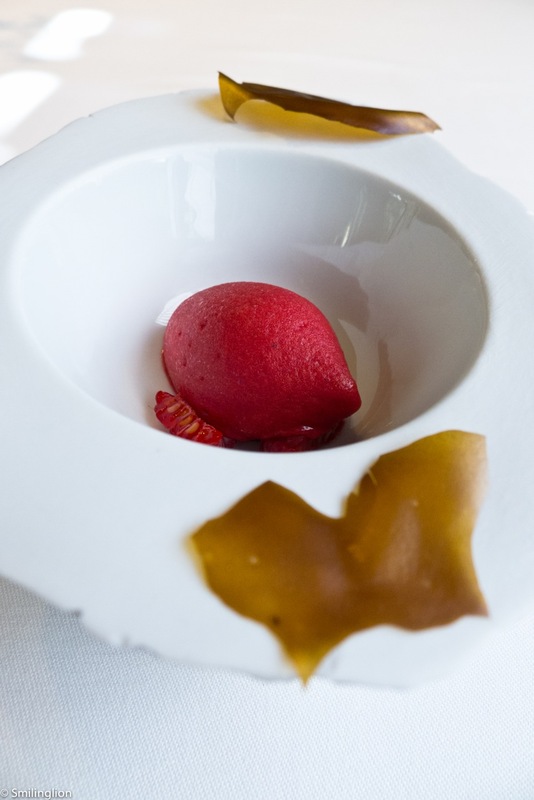 Nitro raspberry sorbet and distilled pears with liquorice: Another sorbet made with nitrogen (though this time they didn't make it in front of us), with very thin burnt liquoriced pear slices. 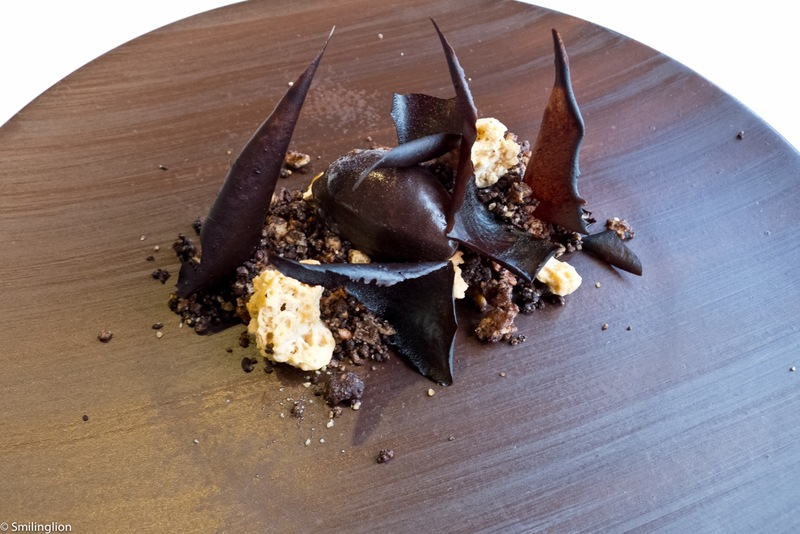 Chocolate and cocoa with hazelnuts, coffee and vanilla: An excellent chocolate dessert, and we particularly love the use of the cake-like shortbread in it. Over snow of yoghurt and biscuits, flower's nectar and violet ice cream: This was such a pretty dish and was also very delicious. 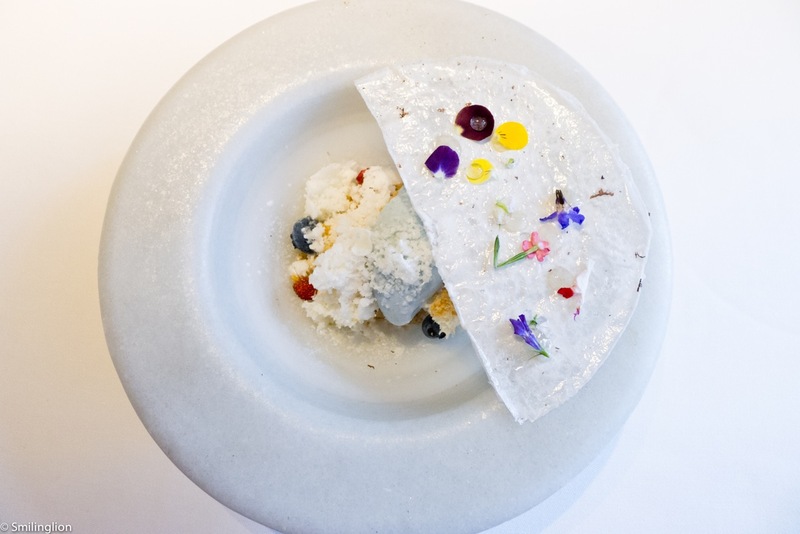 The violet ice cream was bluish-purple in colour and had the flavour of flowers, and the yoghurt snow was milky and slightly tart; neither of which would have been nice to eat on its own. But when taken all together with the sugar disc on top, it was quite amazing. Petit fours did not disappoint, and the familiar favourites of the milk yoghurt and the raspberry lipstick popsicle were well appreciated again. 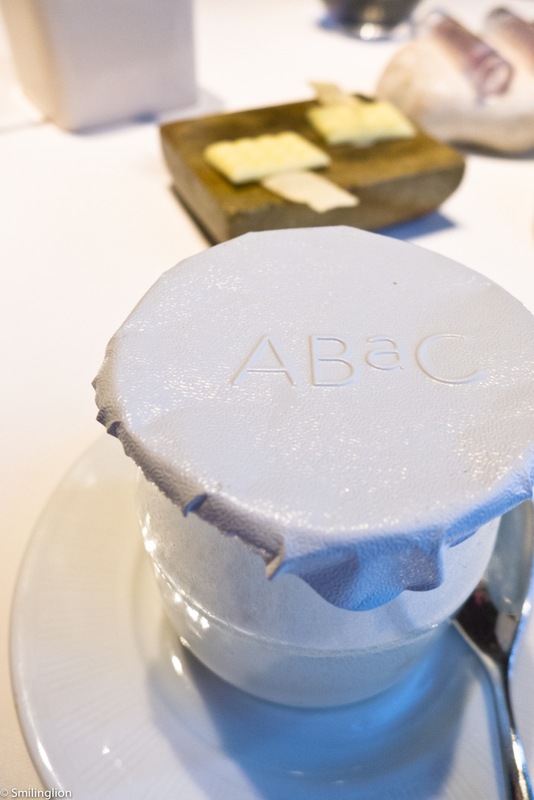 Final Thoughts: Nine months on and we were still blown away by Chef Jordi Cruz's food. This is without doubt our favourite restaurant in Barcelona and the consistency of excellence in both our meals here has been impressive. Although we were seated at the exact same place as before and served by the same people as before, there were many new dishes which wowed us, and some of the dishes which we had before tasted even better than the last time. 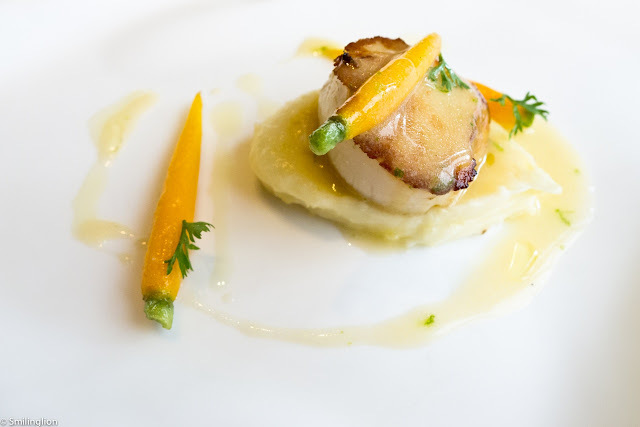 Chef Jordi has found the ideal balance between the solid fundamental cooking techniques which produce food of wonderful flavour and the modern frills and gimmicks which make the dining experience more interesting and entertaining. 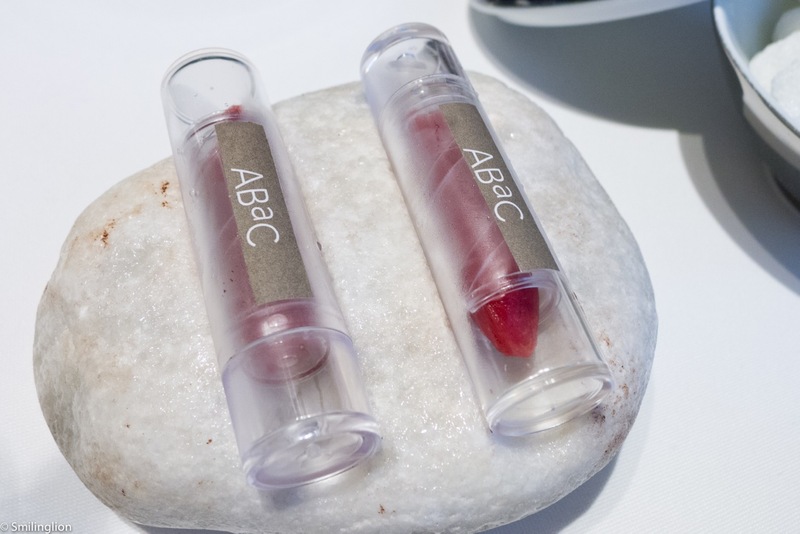 Add the ultra chic and luxurious surrounds of the ABAC Hotel as well as the professional yet attentive service, we suspect that dining at ABAC probably represents the pinnacle of culinary sophistication in this city.